Neckwear Favorite: FibersStudio Scarves | Fashion. Style. Beauty. | Life is short. Live well. I’ve worn them to New York Fashion Week, around New York City and pretty much live in them so it’s time to tell you about one of my personal accessory favorites. 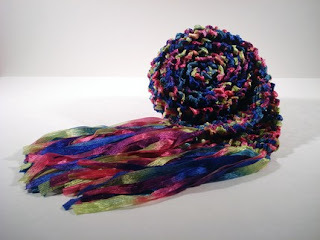 I’m obsessed with FibersStudio scarves, particularly my Carnival Colors Ribbon Scarf ($40). The long, skinny shape is the ultimate rock and roll statement but in pretty rainbow hues that make the skin glow. The scarf is woven from actual ribbon so it’s an all-season option: double or triple the piece around your neck to add layers of warmth or wear it Carnaby Street cool with one chic loop around the neck. Either way, it’s a staple of my wardrobe. FibersStudio pieces are crafted with incredible care by a master fiber artist and come in many colors and shapes to match any wardrobe. Head to their Etsy studio and browse the goods. You might get the urge to tie one on.